Taste test: Not a strong barbecue taste — it's sweet barbecue, lots of smoke flavor. Not hot at all. More of an oily taste. Leaves some residue on your fingers. 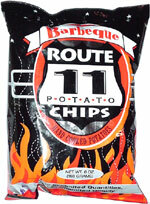 Not a bad chip, really, but not much of a barbecue chip either. Smell test: Smell like paprika chips.